Click on "Bring on the Battle" then follow the click-on directions, mouse over scenes or choose a topic including "Stone, "Archery" or "Knights". This delightful book is full of scenes of medieval castle life, from delicious feasts to life under siege. Each page covers a different element of castle life, from different rooms like the dungeon and the guard room to castle animals such as horses and falcons. 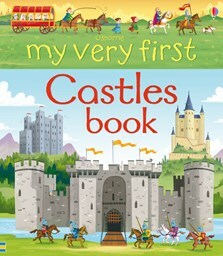 Children can learn how a squire became a knight and how to defend a castle under attack, and special pages show how castles were built and how they have changed over time. With lots to spot and talk about, this is a fun and entertaining way to introduce little children to a fascinating new subject. My two and a half year old son spends a good deal of time pouring over the detailed pictures in this book. Reading it together involves lots of conversation and inquiry on the part of my son. Definitely a new favourite in our household! Thank you!